North Carolina attractions offer year-around mountain fun, adventure and cultural experiences. Some of the most visited NC attractions are Biltmore in Asheville, The Blowing Rock, Tweetsie Railroad, Grandfather Mountain, Chimney Rock Park and the Cherokee Indian Village. Discover North Carolina history and traditions at NC Museums. NC Museums are as varied as the cultures they preserve. From the remarkable culture of the native Cherokee People to indigenous rocks and minerals and historic community heritage, the "mountain ways" and resources are preserved and shared in North Carolina Museums. Most are open daily with modest admittance fees of voluntary donations. For many, the natural wonders of the NC Mountains are the biggest attractions of all. The natural granite monolith Chimney Rock stands 315 feet high affording a remarkable 75 mile view of Lake Lure and the Hickory Nut Gorge. Linville Caverns offer at look inside the mountains and Mount Mitchell is the highest peak east of the Mississippi with a Canadian-like environment. A drive along any NC scenic Byway is breathtaking for all and a shutterbug's dream. NC outdoor adventures provide year around things to do. From Whitewater rafting on the Nantahala with both class II and III rapids to recreational and competitive mountain biking to world class fly fishing in the pristine mountain waters, there are activities for all ages and abilities. Historic NC Homes offer a look into the past of both mountain communities and the people who created them. The most famous mountain home and most popular NC attraction is Biltmore, the dream home of George Vanderbilt. Over the last 50 years more of the original house and gardens has been opened to the public along with newer additions including the winery, a luxury hotel and Antler Ridge. All Aboard! Take a ride on train through the valleys and mountains, across meadows beside a mountain river. At one time, the railroads were the only means of navigating the the steep and winding grades to bring supplies and passengers what were then remote mountain settlements and towns. Although is very limited rail service today, recreational excursions relive the excitement of yesteryear's train travel. Many of the mountain train depots have been restored and are now open attractions for public tours. Spend an afternoon or a weekend exploring the country roads of beautiful Western North Carolina and sample some of the best cheeses being made in the south today. Biltmore - America's "Castle", was built in 1895 by George Vanderbilt and is preserved and maintained today by his descendants. With interior square footage over 4 acres, 250 rooms, 65 fireplaces, 43 bathrooms and an impressive collection of art and period furnishing it is well worth the admission fee and a day's time. Once a working dairy farm the estate now includes a winery, 8,000 acres of trails, Antler Village, gardens and grounds to explore, an on site Inn, fine and casual dining. Carl Sandburg Home - Carl Sandburg, nationally renowned poet, biographer, lecturer, newspaper columnist, folksinger, author of American fairytales, and winner of two Pulitzer Prizes spent the final 22 years of his long and productive life at "Connemara" in Flat Rock, NC. This 264 acre working farm built in 1838, now houses Sandburgs collection of 10,000 books, notes and papers. Daily tours. Thomas Wolfe Memorial - Thomas Wolfe lived in his mother's boardinghouse in Asheville, now the Thomas Wolfe Memorial. The former home has become one of literature's most famous landmarks after being depicted as "Dixieland" in Wolfe's novel Look Homeward Angel, a realistic portrayal of Asheville and its citizens-including Wolfe's own family. The attraction includes an exhibit hall, guided tours, audio-visual program and gift shop. Open daily. Historic Johnson Farm is a non-profit heritage education center and farm museum for area school children and the community. It features an 1880's home, a barnloft museum, 10 historic buildings, animals, nature trails, and 15 acres of fields, forest and streams. The historic farm is listed on the National Register of Historic Places. Oconaluftee Indian Village where the wood smoke drifting on the breeze isn’t like any you’ve smelled before. It’s not the pure tang of hardwood burned for heat. Nor is it the aroma of a cooking fire, fragrant with baking bread or bubbling broth or roasting meat. There’s something earthy about this fire, because it’s smoldering pitch pine, firing local Cherokee clay into gleaming blackware pottery. Then again, all the sights, sounds, and scents surrounding you are novel. In the Oconaluftee Indian Village, it’s still 1750. The Village is open May - October, Monday - Saturday. Asheville Historic Trolley Tours See all the highlights of Asheville from a charming vintage trolley. The narrated tour covers all major points of interest in Asheville including The Grove Park Inn, Historic Biltmore Village, the downtown shopping and restaurant district, Thomas Wolfe Memorial, the Asheville Art Museum and art gallery district, The Asheville Visitor Center and more. Step off the trolley at any of the convenient stops to shop, dine or sightsee, then re-board and continue the tour. Tours are available year around, 7 days a week. LaZoom Comedy Bus Tours show you Asheville "with a twist". The daily tour season runs from April 15 through October 31 with special events, live comedy shows, live music and holiday tours all year long. Get on the bus and laugh your Asheville off! Asheville Brews Cruise - Take a tour of Asheville's award-winning beer scene with a guided tour of 3-4 of the 10 local breweries. The behind-the-scenes tour includes the processes involved in brewing as well as generous samples of each brewery’s fresh and delicious brews. Quilt Trails of Western North Carolina - The WNC Quilt Trails offers over 200 quilt blocks, the highest concentration anywhere in the country. Nine different driving trails traverse beautiful mountain scenery providing the backdrop for vividly painted quilt squares installed on barns and buildings in participating communities. The YMI Cultural Center is an Asheville landmark in the heart of downtown, convenient to City Hall, and Pack Place. Listed on the National Register of Historic Places, the YMI has served Asheville's minority citizens since it was first established in 1893 as the Young Men's Institute. It houses numerous exhibits, many dealing with the history of African Americans in Western North Carolina, and sponsors such cultural events as Asheville's Goombay! Festival, an Annual Kwanzaa Celebration and the Martin Luther King, Jr. Birthday Celebration. All people are welcome to come share in the rich heritage and celebration of African and African American culture. Scottish Tartans Museum - A visit to the Scottish Tartans Museum and Gift Shop in the Smoky Mountains is a stroll through the history and culture of Scotland. The 4800 square foot location on Main Street in downtown Franklin, showcases a large Museum area as well as an expansive Gift Shop. Wheels Through Time Museum - the museum that runs, is easily the finest collection of all American vintage motorcycles in the world and an astounding collection of rare American made automobiles. A collection of over 250 rare antique American Motorcycles and Automobiles. Equally as astounding is the memorabilia collection. A ride through history has something for everyone. Open 7 days a week. The Franklin Gem and Mineral Museum Located in Franklin’s historic “Old Jail” on Phillips Street across from the Macon County Courthouse, the Franklin Gem and Mineral Museum has thousands of specimens on display including a local ruby weighing 2 ¼ pounds! The museum was founded in 1974. Swannanoa Valley Museum -	For millennia, the Swannanoa Valley has been a pathway for both animals and humans. After the Revolutionary War, pioneers entered the Valley. Some such as Col. Samuel Winslow Davidson (left) settled here. Others, including famed frontiersman Davy Crockett, passed through on their way west. Discover for yourself the historical pathways that led to the settlement of the Swannanoa Valley, Buncombe County, and Western North Carolina. Located at 223 W State Street Black Mountain. Transylvania Heritage Museum - During the 125th anniversary celebration of Transylvania County, NC in 1986, hundreds of people signed a petition encouraging the formation of a county museum. The Jim Bob Tinsley Museum, a non-profit organization, was opened in May 1994 in Brevard, NC. In 2003 the Transylvania Heritage Coalition (THC) was formed. The THM opened in May 2008. It now houses temporary and permanent displays of heirlooms, artifacts, genealogical exhibits, vintage photographs, and other exhibits reflective of the history and heritage of the county. The Mineral and Lapidary Museum of Henderson County was established in 1997 and houses exhibits from North Carolina, replicas of world famous diamonds, English minerals, Indian artifacts, a dinosaur egg nest, fossils, fluorescent minerals, gems, and faceted minerals1. The Museum's specialty are Geodes, which are sold, cracked and/or displayed. Admission is free. The Western North Carolina Air Museum is the first air museum in the state of North Carolina known as the "first in flight" state. The museum features award winning restored and replica antique and vintage airplanes. Open (weather permitting) Mar-Oct, Wed and Sun 12 Noon-6 PM, Sat 10 AM-6 PM; Nov-Feb Wed, Sat and Sun Noon-5 PM . Admission is free. Henderson County Museum is located within the Henderson County Historic Courthouse and consists of six rooms, approximately 2000 square feet designed for flexibility, capability, and versatility. The Museum collects, preserves, researches, and exhibits a collection of historical and cultural artifacts. Hours are Wed - Sat 10 AM- 5 PM, Sun: 1- 5 PM Local history, culture and artifacts with special events, children's exhibits and events and a gift shop. Mountain Gateway Museum and Heritage Center The museum is the westernmost branch of the NC Museum of History family. As a part of the NC Department of Cultural resources, it is dedicated to bringing life to the wonderful history of the "Old North State". A variety of educational and historical exhibits are available for public viewing including: Remedies From the Past: Folk Medicine in Western NC; Spinning and Weaving; Moonshining; A Time to Plant and a Time to Pluck and two 19th Century cabins on the museum's grounds. The Mountain Gateway Museum is located at 102 Water Street in Old Fort NC. Wilkes Heritage Museum Exhibits Range from Civil War to NASCAR. ne of the race cars driven by NASCAR legend and Wilkes County native Junior Johnson is here‚ and so is a piece of the military jacket worn by Gen. Robert E. Lee. They are among the hundreds of exhibits being showcased at the Wilkes Heritage Museum‚ which opened to the public in November 2005. Candlelight Ghost Tours at Wilkes Heritage Museum - Think you’ve seen a ghost? That just might be the case if you take part in the Wilkes Heritage Museum’s monthly Candlelight Ghost Tours. The nightly excursions take place from May through Halloween in buildings located throughout Old Wilkes‚ including the Old Wilkes Jail‚ Smithey Hotel and the Presbyterian Cemetery. Unto These Hills is an outdoor drama presenting the history of the Cherokee Indians in a beautiful Mountainside Theatre. In 2006, “Unto These Hills” began a new script, new director, new score, new choreography, new set design, new costuming and new cast members ­ all aimed at conveying a more culturally authentic, historically accurate and Cherokee-centered experience. The new play traces the Cherokee people through the eons, through the zenith of their power, through the heartbreak of the Trail of Tears, finally ending, appropriately, in the present day, where the Cherokee people, much like their newly re-scripted drama, continue to rewrite their place in the world. Performances are offered mid-June through late August, Monday - Saturday at 7:30 PM. The Flat Rock Playhouse has been operating for more than 53 years. This State Theatre of North Carolina has been thrilling audiences with Broadway musicals, comedy and drama. From the Youth Theatre education program to professional main stage performances, Flat Rock Playhouse offers the best live entertainment in Western North Carolina. In 2011 the Playhouse added an additional venue in historic downtown Hendersonville. Brevard Music Center - Each summer more than 400 students, ages 14 through post-college, join professional musicians to eat, breathe and sleep music for seven weeks. In addition to a rigorous schedule of instruction, students collaborate with faculty and guest artists in more than eighty public performances. Horn in the West at Hickory Ridge Homestead is an outdoor Historical Drama and 18th Century Living History which first premiered in 1952. One of the nation's oldest Revolutionary Dramas still performed, Horn in the West portrays the lives of pioneers who survived the wilderness challenges to settle in the Blue Ridge Mountains. Through drama, dance and music a cast of 50 performers takes you back 230 years to the American frontier. Parkway Playhouse - Celebrating 60+ years! Parkway Playhouse, established in 1946, is North Carolina’s oldest continually operating summer theatre. Past productions have included: Annie, Guys and Dolls, Tom Dooley, Leaving Iowa, Pride and Prejudice - plus children's and holiday productions. North Carolina Stage Company Asheville’s professional theatre performs in an intimate off-Broadway style venue in the heart of downtown Asheville. Voted Asheville's Best Local Theater for three years in a row for a diverse season of gripping dramas, classics, family plays and outrageous comedies. Schedule varies. The Great Smoky Mountains Railroad offers the romance and mystique of an era gone by. Guests on board the Great Smoky Mountains Railroad will enjoy scenic train journeys across fertile valleys, through tunnels and along river gorges in a spectacular region called the Smoky Mountains. Excursions are available all year with special holiday and seasonal events. For more physical adventure check out GSMR packages for train rides and whitewater rafting, hiking trails or the Tarzan Train. Tweetsie Railroad, North Carolina's first theme park, takes a trip back into the days of the Old West. Hop aboard the train for an unforgettable three-mile journey through the scenic mountains. Even in today's high-tech world, there's still a place for old-fashioned fun. Tweetsie Railroad is a unique attraction that allows children and families to explore their imaginations and a whole lot more. Be a cowboy, Indian or an engineer and take a ride on historic steam locomotive, Number 12, listed on the National Register of Historic Places. Open daily April - October with special events offered. Hendersonville Historic Train Depot The first steam engine puffed up the Saluda Grade to the Hendersonville Depot in 1879, the steepest main-line standard gauge railroad in the United States. The Carolina Special ran between Charleston, South Carolina and Cincinnati, Ohio from 1911 until 1968.Today the exterior paint has been restored to its original color. A Southern Railway caboose is located at the south end. 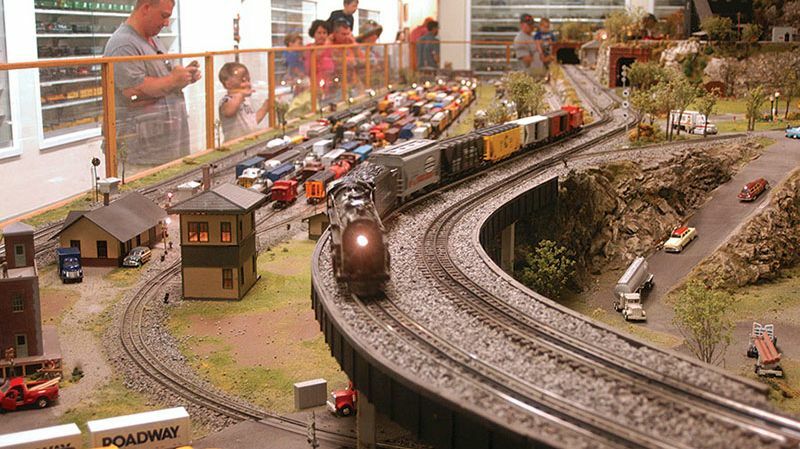 The depot's baggage room houses the Apple Valley Model Railroad Club and their HO scale model railroad. Open to the public on Saturdays. Smoky Mountains Train Museum The Museum is a collection of 7,000 Lionel™ engines, cars and accessories, impressive operating layout, children’s activity center, and gift/toy shop, Smoky Mountain Trains has something for everyone. Admission charged, but with every purchased train ticket admission to the Museum is FREE. The Folk Art Center is home base for the Southern Highland Craft Guild. The Center includes a permanent collection, theme exhibits, demonstrations, education, special events, and a shop. The beautiful grounds are nestled in the woods along the Parkway in West Asheville. A short trail surrounds the building and features exhibits of native trees. Another trail connects with the Mountain to Sea trail. The Center also houses a Parkway Visitor Information booth and book store. Penland School of Crafts is a national center for craft education located in the Blue Ridge Mountains of Western North Carolina. Penland offers one, two and eight week workshops in books and paper, clay, drawing, glass, iron, metals, photography, printmaking, textiles, and wood. The school also sponsors residencies, educational outreach programs, and an exceptional Gallery and Shop. Studio tours are open to the public. John C Campbell Folk School provides experiences in non-competitive learning and community life that are joyful and enlivening. Located in scenic Brasstown, North Carolina, the Folk School offers year-round weeklong and weekend classes for adults in craft, art, music, dance, cooking, gardening, nature studies, photography & writing. Gallery and Craft Shop and special events are open to the public. The River Arts District is open year around with the opportunity to meet artists in their studios. Schedules are available online. This unique area along the French Broad River is home to more than 165 artists with working studios located in 18 turn-of-the-century industrial buildings. The artists of the River Arts District welcome you into their studios to talk with them, see their latest artwork, watch demonstrations, and experience for yourself the magic hidden inside the time-worn factories and warehouses along the French Broad River. Center for Crafts, Creativity and Design CCCD is a regional center of the UNC with a strong nonprofit support organization. It is located at 67 Broadway Street in Asheville NC. It supports research in craft and design and curates exhibitions for a small gallery space and the sculpture and public art on the property's one-mile Rudnick Nature Trail. Mystery Hill is a fascinating exploration of science, optical illusion and natural phenomena. The tour includes the Mystery House where visitors can stand at a 45° angle, the Hall of Mystery, the Puzzle Room, and Bubble-Rama. 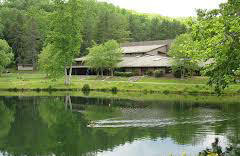 It also includes the Appalachian Heritage Museum and the Native American Artifacts Museum with 50,000 relics. The Grove Arcade - Built by E.W. Grove, the visionary and creator of the Grove Park Inn, the Grove Arcade opened in 1929 and thrived until World War II as one of the country's leading public markets. Asheville's historically renovated Grove Arcade has once again returned as a destination featuring the best the region has to offer from fabulous foods to delicious dining and local crafts. The wonderful design and architecture alone are worth a trip to Asheville. Biltmore Village Built in the late 1890's as a classic planned community at the entrance to George Vanderbilt's Biltmore Estate, Biltmore Village today is truly one of the Carolinas' most unique touring and shopping environments. It's the way shopping used to be - relaxed and enjoyable with top quality merchandise at realistic prices and wonderful customer service. Enjoy quaint tree-lined streets, brick sidewalks, open air dining, original houses from the 1900's, all combined with amazing collections of one-of-a-kind merchandise of true quality and value. Cherohala Skyway Length: 43.0 mi / 69.1 km Time to Allow: 2 hours to drive the byway . The Skyway offers the cultural heritage of the Cherokee tribe and early settlers in a grand forest environment in the Appalachian Mountains. Enjoy mile-high vistas and brilliant fall foliage, as well as great hiking opportunities and picnic spots in magnificent and seldom seen portions of the southern Appalachian National Forests. Forest Heritage National Scenic Byway Travel back in time and explore history and beautiful scenery on the Forest Heritage National Scenic Byway (U.S. 276) through the Pisgah National Forest. As you wind your way on old settlement roads past mountain peaks and cascading waterfalls, imagine how this landscape looked decades ago when modern forestry began. Begin your driving journey at the southern entrance to the Pisgah National Forest, once marked by an arch. Today twin columns greet you as you enter one of the earliest National Forests in the eastern United States. The Appalachian Trail in North Carolina. The Trail crosses Western North Carolina from the Georgia border to the Great Smoky Mountains National Park for about 95.9 miles before turning along the Tennessee border for another 287 miles until it exits NC at the Virginia border. There are long climbs in the Stecoah-Cheoah Mountain area, and an outstanding section in Nantahala with 4,000-foot gaps and 5,000-foot peaks. Cheoah Bald offers panoramic views of western North Carolina. This part of the A.T. provides a feeling of remoteness, and a sensation of being in deep forests. The variety of forest growth and the beauty of the flowering shrubs, along with the many spectacular views, make this entire section of Trail memorable. The AT section from the Nantahala River to the Georgia border features some the best-graded trail at high elevations and there are lots of views from natural openings and fire towers, some requiring short side trips. Roan Mountain: Known for it's expansive grassy balds and flowering rhododendrons this area of the AT offers gorgeous panoramic views. Visit the Roan Mountain recreation area to find restrooms, picnic tables and a paved half-mile trail. Or park at Carver's Gap for a longer seven-mile hike. Get a description here. Cherohala Skyway was completed in the fall of 1996 after nearly thirty-four years. It is North Carolina's most expensive highway carrying a price tag of $100,000,000. Winding up and over 6,000 foot mountains for 15 miles in North Carolina and descending another 21 miles into the deeply forested backcountry of Tennessee. The road crosses through the Cherokee and Nantahala National Forests thus the name "Chero...hala". The Pacolet River Byway begins at the South Carolina state line and traces its way through the Tryon Thermal Belt, an area with an unusual climate that is usually free from dew or frost. The route crosses the Pacolet River several times and runs parallel with the Saluda Grade, the steepest mainline railroad grade in the United States. 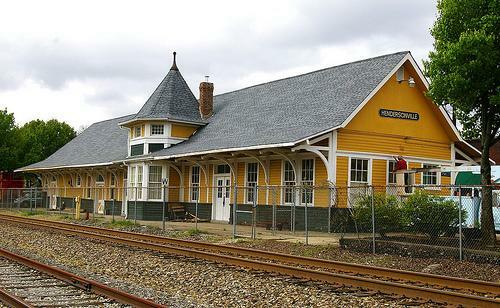 Old railroad depots, log cabins and other historic buildings can be found in the towns of Saluda and Tryon, while Pearson Falls Natural Heritage Site is a 259 acre botanical wonderland where visitors can hike, bird watch or just enjoy the outdoors. Tryon houses the Polk County Historical Museum, whose 1906 train station was once the center of activity for the area. Tryon NC and Saluda NC area. Navitat Canopy Adventures, a world-class zip line canopy tour near Asheville, combines the exhilaration of a zip line tour with the educational experience of a Costa Rican rainforest-style canopy excursion. Night tours had been added for the 2011 season. The canopy tour course is entirely tree-based and features two sky bridges, two rappels, and 10 zip lines ranging from 120 to 1,100 feet in length -- including one that sends guests soaring more than 200 feet above the forest floor. Located 30 minutes north of Asheville in Barnardsville NC. Asheville Zipline Canopy Adventures is located within the city limits only a half mile from downtown Asheville. Its unique urban location allows views of both treetop and mountains along with the beautiful Asheville skyline. The Adventures includes 11 zipline sections, nine treetop platforms, three adventure tower platforms, three sky bridges and ziplines from several hundred feet long to almost 1200 feet long. Participants are able to reach heights of more than 70 feet and speeds of about 30 miles per hour. All tours include full instruction and orientation. Nantahala Gorge Canopy Tours soar through the Smoky Mountains with views of views of Clingman’s Dome, Fontana Lake and waterfalls. The adventure takes place over 20 acres with 13 ziplines, 8 bridges and 4 tandum zips. Zip instructions and ecosystems information is provided by knowledgeable guides. Zip and Rail packages now available. Located near Bryson City NC. Nantahala Outdoor Center (NOC) offers white water river rafting trips, kayak and canoe instruction and mountain biking. NOC is a a complete outdoor destination with three restaurants and a pub, a fully-stocked Outfitter's Store, the Wesser General Store and Fly Shop and the Nantahala Welcome Center. Wildwater Nantahala offers 8 miles of exciting rafting on the pristine Nantahala River. Facilities include changing rooms with hot showers, a well-supplied river store, WIFI and picnic tables. Each trip includes a guide and over 3 hours of class I and II rapids, ending with class III. Located near Bryson City NC. NC Ski Resorts and Ski Areas offer the highest mountains east of the Rockies for skiing, snowboarding, snow tubing, ice skating and winter sports. With minimal natural snowfall in the NC Mountains the ski season relies on snowmaking machines and cold temperatures. The season begins in November and continues into March, with specific times varying depending on the having enough cold weather to allow for snowmaking. New River Route - a flat, gentle trail along the south fork of the New River in Ashe County.The route, which follows Railroad Grace Road, is extremely level and easy to ride. Views from the route include the river, lush pastoral settings and Christmas tree farms. Linn Cove Viaduct - a section of the Blue Ridge Parkway which dramatically snakes around mountainsides and seems to float magically above Linn Cove. The route begins at Julian Price Memorial Park	with a slow, gradual seven-mile ascent. There are overlooks and beautiful views along the way including the distant Grandfather mountain. The good news is that the return trip is downhill. Cashiers Tour - enjoy being surrounded by the Nantahala National Forest. At 10 miles, one of the shorter routes, but certainly challenging with a significant ascent to the Cashiers plateau. Wonderful views are found at every turn including peaks, valleys, waterfalls and lush forests. Tsali Trails - in the heart of the Nantahala National Forest are a series of mountain biking trails for the off-road enthusiasts. With more than 40 miles of hilly trails sectioned into Loops offering varying degrees of difficulty. Discover interior hills, creek crossings and overlooks. Big Avery Loop - a strenuous 12.9 mile trail through the Pisgah National Forest. The challenges include ascents over at least eight water bars, a series of rock steps called Satan’s Staircase, a harrowing ride through a rhododendron tunnel and a track so narrow it’s not much wider than a bike tire. Among the highlights is a stunning view of Looking Glass Rock. This is a trail for experienced mountain bikers.